Suspension Fluids for Performance Racing from Torco Oil. Including Racing Fork and Racing Shock Fluids. Essential motor fluid for any racer. Get yours today at CAM. RFF Racing Fork Fluid - Grade 10W from Torco Oil are a series of high V.I. synthetic blend fluids designed to exceed the demands of all cartridge and damper rod applications. RFF maintains visc..
RFF Racing Fork Fluid - Grade 15W from Torco Oil are a series of high V.I. synthetic blend fluids designed to exceed the demands of all cartridge and damper rod applications. RFF maintains visc..
RFF Racing Fork Fluid - Grade 20W from Torco Oil are a series of high V.I. synthetic blend fluids designed to exceed the demands of all cartridge and damper rod applications. RFF maintains visc..
RFF Racing Fork Fluid - Grade 5W from Torco Oil are a series of high V.I. synthetic blend fluids designed to exceed the demands of all cartridge and damper rod applications. 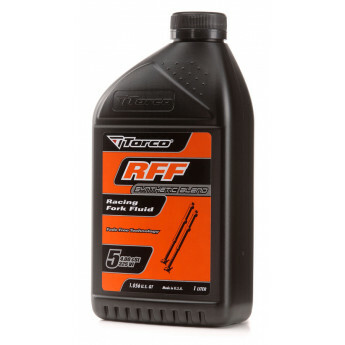 RFF maintains visco..
RFF Racing Fork Fluid - Grade 7W from Torco Oil are a series of high V.I. synthetic blend fluids designed to exceed the demands of all cartridge and damper rod applications. RFF maintains visco..